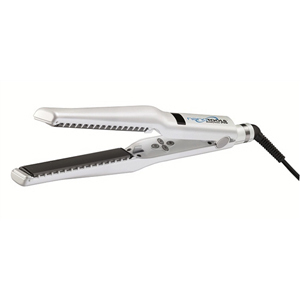 The BaBylissPRO Memory Angle Styler is a versatile styling tool that straightens, flips and waves with ease! The 30-degree angle and floating plates make it easy on the wrist while providing 100% contact with hair. Go straight, create a flip with a flick of the wrist or gently rotate the iron to make some waves. The channels guide and spread hair evenly across the plate for uniform results as the exclusive hybrid mineral complex of nano ceramic and Japanese minerals emits high levels of negative ions and infrared heat for faster styling with more shine.